Your suit works hard. It handles business meetings and special occasions; it gives you the inner confidence to do things like negotiate a raise or get married in front of everyone you know; and ideally, like Superman’s stretchy tights, stepping into it transforms you (a regular human guy) into something 100% more extraordinary. So shouldn’t you repay the favor by letting your suit have a little fun once in a while? Swapping your go-to shirt and tie for a bold graphic tee is just the kind of R&R you and your tailored threads need right now. 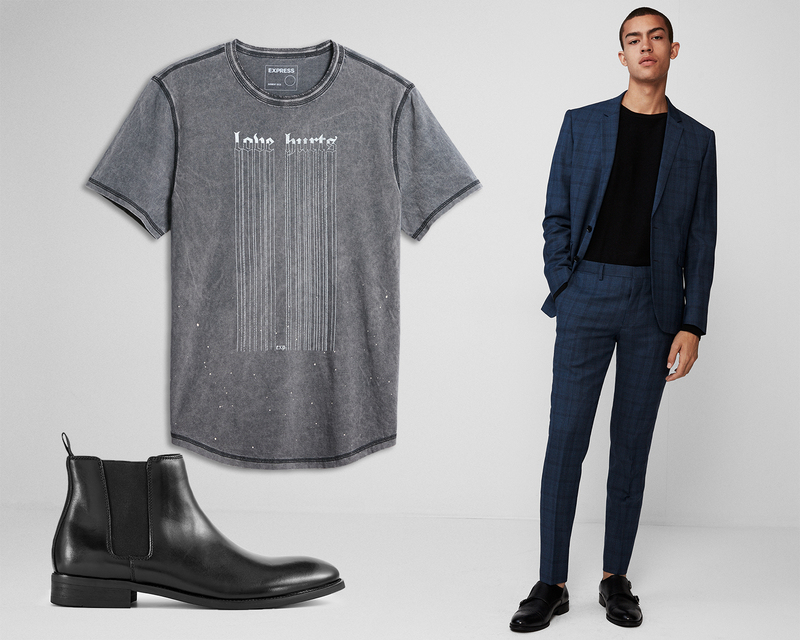 Not only will it shake up your Monday through Friday wardrobe—in a good way!—but wearing a T-shirt with your suit has the power to make you stand out from the rest of the dull suits in your office. Yesterday you were the guy requesting a revised PDF. 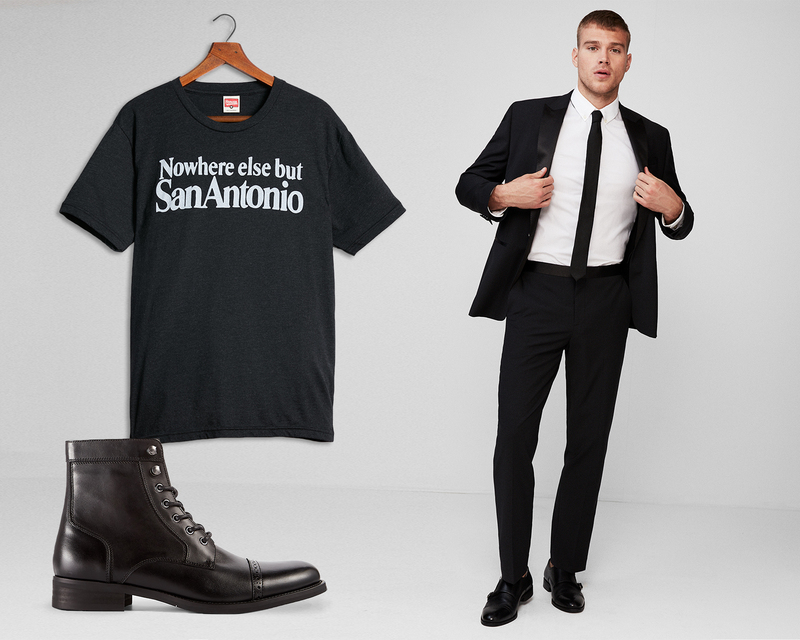 Today you’re turning casual Friday into “outdress every man in sales” Friday. As we face down the last few weeks of winter, pulling on shorter breezier sleeves and skipping the tie altogether feels like a much-needed vacation (sun and sand not required). 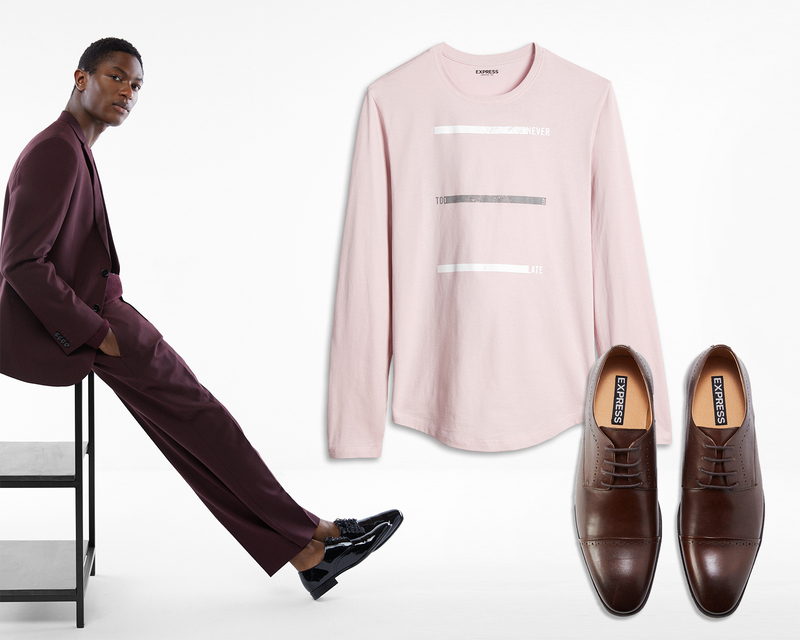 Tonal Master: New to the whole bold-colored suiting trend? Keep things in check with a tonal tee. But before you take the T-shirt with a suit leap, you’ll need to do a little self-searching. Are you an abstract minimal kind of guy? Or more of a distressed and worn alllll the way in type of fella? Or do you like your T-shirt to pledge allegiance to your favorite team? Whatever your style, our roster of graphic tees has what you’ll need to get started. Classic Cool: There is no combination more iconic than navy and off-white. Make this pairing look fresh with a suit that’s a little bit shiny and a distressed graphic tee. A few pro tips to keep in mind: Fit matters most of all. Because your cool new T-shirt doesn’t mean a damn thing if it’s not flattering your body. When wearing a shirt with your suit, go for slim over boxy—it has to fit gracefully beneath your jacket, remember? You want it to hug your torso but not squeeze it. And the bottom hem should land in the center of your belt. 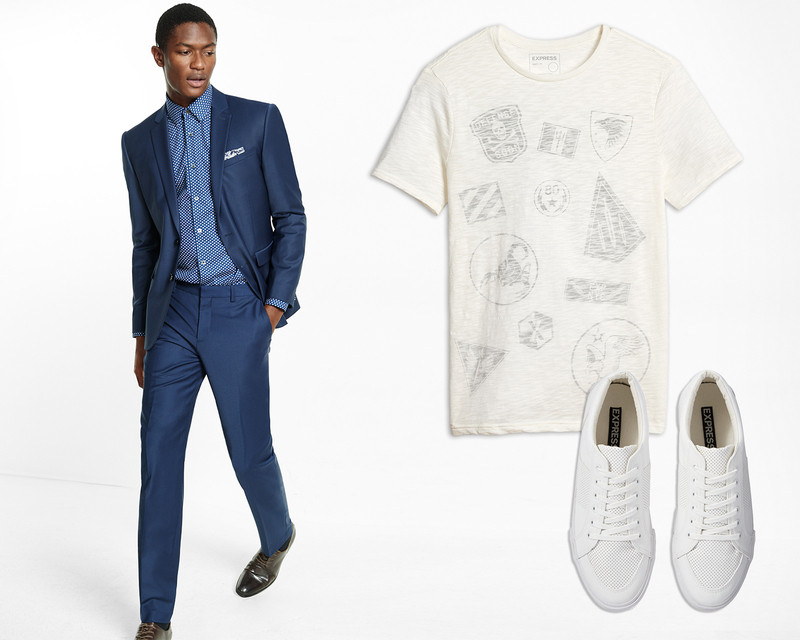 Dressy Casual: When your suit is this sharp, adding a contrasty black and white T-shirt is your best move. If you choose to tuck in your tee, do it casually, pulling up a small amount of slack after the initial tuck. Once you’ve nailed the fit, choose a T-shirt in the same color family as your suit. Grayish blue with navy, dusty pink with burgundy, or light gray with black. The similar tones will ensure nothing clashes or looks out of place, and the differing shades will give your overall look some depth. Pattern Genius: Like bold colors, all-over patterns can be overwhelming at first. Calm your nerves with a simple and not-so-saturated T-shirt. You can also match a color in your tee’s printed graphic to the color of your suit. Choosing a graphic tee will make sure no one confuses your tee for an undershirt, but you also want to make sure you’re choosing a graphic that won’t overpower your suit. Stick to two colors at most and err on the side of simple, understated designs and fonts. A few lines of text, a well-placed logo, or some faded geometric shapes will do the trick. Now go forth, step into your suit, and let the compliments roll in.